The Konkan region of India, which is situated along the country’s western coast, was the original home to the Saraswat Brahmin. The cuisine of Saraswat stems from Goa and varies between the differing regions and sub-sections of Saraswat Brahmins, with each having its own individual flavour and repertoire of staple dishes. Two common features unite the cuisine of these regions, however: it is mainly comprised of pesc-vegetarian meals (although some follow a strictly vegetarian diet) and it makes ample use of the array of local, seasonal fruits and vegetables. South Indian cuisine has played a major role is shaping vegetarian Saraswat cuisine, with staple ingredients such as tamarind, coconut and curry leaves featuring heavily in its curries. Most dishes are cooked using coconut oil, which is known for its health-giving properties, and are typically mild in terms of their spice. Although not all Saraswat Brahmins are strictly vegetarian, on certain days – usually a Monday – all Saraswat Brahmins will eat only vegetarian foods. One section of Saraswat Brahmins, the Satkiv Brahmins,enjoy a particular type of vegetarian cuisine known as ‘savalemranapp.’ Satkiv Brahmins will not use or eat any vegetable that has been harvested from beneath the ground, including garlic and potatoes, for example. This strict diet is adopted by many people of the Konkan region during religious festivals and holy celebrations. Some examples of popular vegetarian dishes include Karams (vegetable salads); Usal (spicy pulses cooked in a thin gravy); Misal (Usal topped with fried garnishes); Ross (dishes with a coconut base);Tondak (beans and cashew nuts); Nonche (pickles); as well as a selection of different Papads (flatbreads). The majority of Saraswat Brahmins are pesco-vegetarians, meaning that they can consume fish and seafood – although their diet is not seen as being ‘non-vegetarian’. Folklore suggests that when the Saraswat River dried up, the locals didn’t know how to farm and so were permitted to eat seafood in order to survive. During this time, fish were referred to as ‘sea vegetables’ – and to this day, oysters are still known as ‘samudraphalam,’ meaning ‘sea fruit’. A pesco-vegetarian diet focuses on seafood, coconut and cashew nuts, all of which are available in abundance locally. The curries can be both dry and gravy-based, with many dishes using the addition of red chilli powder to provide a bold, rich colour. Other spices used in these curries include cumin, coriander and mustard seeds, to name just a few. 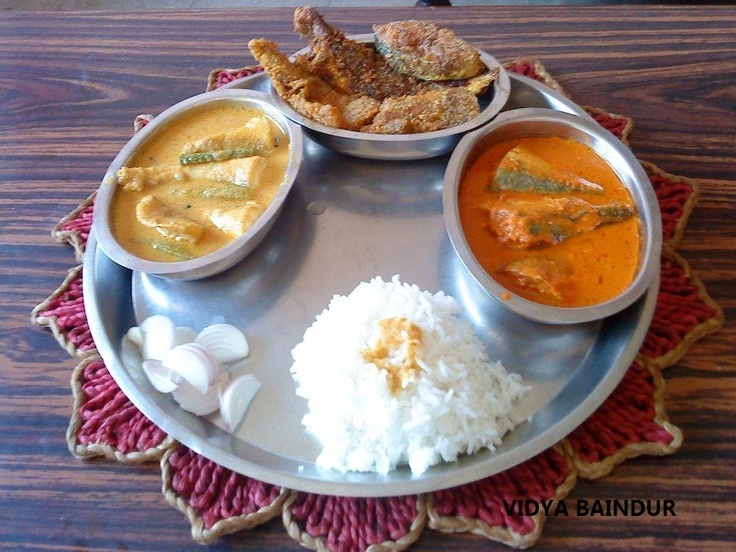 The pesco-vegetarian Saraswat Brahmin cuisine branches off into Goan cuisine, with one synonymous dish beingHoomananiXit – fish curry (Hooman) served with rice (Xit). Goan cooks incorporate a range of fish including mackerel, tuna and shark, along with numerous types of shellfish, such as prawns, mussels, lobster, crab and squid. Meanwhile, Khatkhate Curry is an immensely popular vegetarian stew, made using at least six varieties of vegetable. Whether you’re a vegetarian, pesco-vegetarian, or fully-fledged meat-eater, you can sample a range of authentic regional Indian dishes at one of London’s best fine-dining Indian restaurants.